If you're thinking about planning a trip to Tahiti, it's only natural to wonder about what time of the year would be the ideal time to visit. According to VisualItineraries.com, "The annual average temperature in Tahiti is 80 degrees Fahrenheit." There isn't much variability in the temperature there, with temperatures ranging from 70 to 85 degrees Fahrenheit throughout the year. It is always warm in Tahiti. The most significant weather-related change has to do with the amount of rain and the resulting humidity. According to the World Weather & Climate Information (WWCI) website, "December is the wettest month," but the full rainy season runs throughout the summer (November through April). If you prefer dry conditions, you will want to avoid the rainy season. If you don't mind heat and humidity, the rainy season may be a great option for your trip. If you want to enjoy the best weather (i.e., the least hot and the least rainy), go during the winter (May through October). If you want to minimize your exposure to the heat, go during July. Keep in mind, though, 'cool' is relative when you're talking about visiting Tahiti. While WWCI reports July is typically the 'coolest' month there, it will still be quite warm. If you want to minimize your chances of experiencing rain, plan your trip during September. According to WWCI, "September is the driest month." If you are a fan of hot, humid weather and you don't mind getting rained on, January may be the best time for you to visit. That's because, as WWCI points out, January is Tahiti's warmest month, and it is also during the rainy season. While the idea of visiting during peak season might be appealing, keep in mind this is when airfare and hotel rates will be the highest and things will be most crowded. According to TravelOnline.com, "Tahiti's 'peak' season runs from May to October, with the three busiest months being June, July and August." Tahiti is also a popular destination for the Christmas holidays. If you don't mind the crowds and are willing to pay premium prices for travel and hotels, the peak winter season may be the perfect time for your trip. USA Today recommends planning your trip far in advance if you want to visit during the busiest months as flights and hotels sell out far in advance. If you want to avoid the crowds and spend less money, then consider traveling during the off-peak summer season, with the exception of Christmastime. Just know to expect warmer and rainier conditions. That may be a small price to pay for a less costly journey. For a middle-of-the-road option, plan your trip early or late in peak season to avoid the highest prices and biggest crowds, while still experiencing a reduced chance of rainy, humid weather. This would entail planning your trip for May, September, or October. Tahiti is home to a variety of festivals and events throughout each year. Check out TahitiTourisme.com to get a sense of the kinds of activities planned during different times of the year to help decide which month might be best for your visit. Some events may vary from year-to-year, but there are a number of annual special events. For example, Tahiti Carnival takes place each October, and Tahiti's largest cultural festival (Heiva i Tahiti) runs June 29 through July 14. If you visit during September, you may get to participate in the Tahiti International Tourism Day. 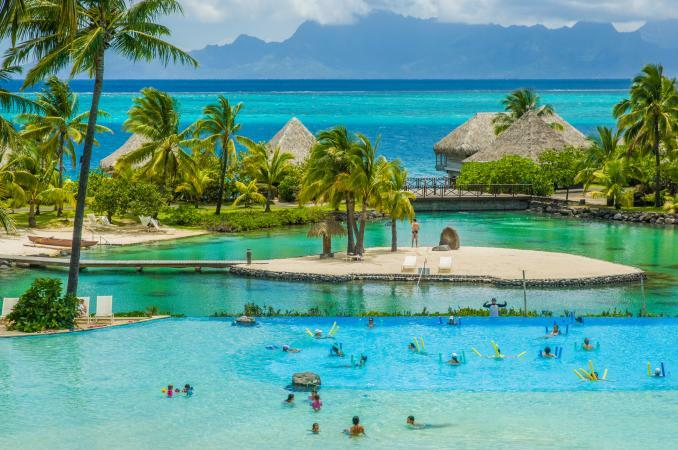 Ultimately, deciding when to visit Tahiti is a decision you'll have to make for yourself, in conjunction with the friends or relatives with whom you'll be traveling. The most important thing is to schedule vacation dates that are convenient for everyone in your group. By choosing your dates in advance and shopping around for the best deals, you will be able to book a lovely getaway to this South Pacific island paradise. Even a hot, rainy day in Tahiti is probably better than a regular day just about anywhere else!